Enjoy your favourite gin cocktail in the form of a cake, with this gorgeous gin and tonic cake recipe. 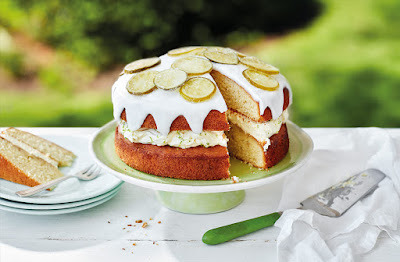 It has all the aromatic flavour of a glass of ‘G&T’, with juniper and lime-flavoured sponges soaked in a gin and tonic syrup, a fluffy lime cream filling and a sweet gin icing. Topped off with candied lime slices, this is a boozy cake that is sure to impress. To make the syrup and candied limes, put the tonic water and 100g of sugar in a small pan and stir over a medium heat until the sugar dissolves. Bring to the boil and cook for 2-3 mins, until it has thickened slightly. Meanwhile, thinly slice 2 of the limes. Zest and juice the remaining lime, reserving the juice for the syrup and the zest for the filling. Add the lime slices to the pan of tonic syrup and reduce the heat to low. Cook for 10 mins until the slices become translucent. Strain the syrup through a sieve into a jug, leaving the lime slices to drain in the sieve. Add the juniper berries, gin and reserved lime juice to the syrup and set aside to cool. Put the remaining 50g sugar in a shallow dish and add the lime slices, tossing well to coat in the sugar. Spread the candied slices out on a tray lined with baking paper and leave to dry out for at least 2 hrs. Preheat the oven to gas 6, 200°C, fan 180°C. Grease and line the bases of 2 x 20cm round cake tins. Put the butter, sugar, juniper berries and lime zest in a large bowl and beat together with an electric whisk until pale and fluffy. Add the eggs one at a time, beating slowly until just combined. Gently fold in the flour followed by the gin until the mixture is just incorporated. Divide between the prepared tins and bake for 25-30 mins or until the cakes are golden and feel springy to the touch. Allow the cakes to cool in their tins for 5 mins, then pierce all over with a skewer or cocktail stick. Brush the syrup over both cakes, allowing it to sink into each sponge. When cool enough to handle, remove from the tins to cool completely, keeping the baking paper on the bottom of the sponges so the syrup doesn’t leak out. To make the filling, put the whipping cream in a large bowl and add the reserved lime zest from the syrup. Whip together until thick but not too stiff. Once cool, peel the baking paper off the cakes and transfer one to a serving plate. Spread with the lime cream and top with the second cake. Put the icing sugar in a bowl and mix in most of the gin, adding more gin as needed to form a thick, pourable icing (you may not need all of it). Pour the icing over the top of the cake, starting from the middle and moving outwards, letting it drip down the sides a little. Allow the icing to set for about 10 mins before decorating the top with slices of candied lime. Slice and serve. Tip: For a simpler decoration on top of the cake you can leave off the candied lime slices. Make the syrup and cakes as above. Fill and ice, then grate over the zest of a lime before serving. The sponge cakes (without filling or icing) will keep in an airtight container for up to 3 days or can be frozen for a future occasion. Freeze the cakes only. Bake according to the recipe but stop before adding decoration. Allow to cool completely. Wrap in clingfilm and foil to prevent freezer burn and freeze for up to 3 months. Loosen the foil and clingfilm but leave to defrost still wrapped at room temperature for several hours before serving.